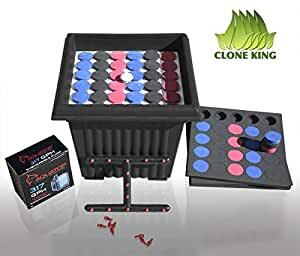 The Clone King 36 Site Cloning Machine Utilizes An Aeroponic Cloning Method To Make Successful Cloning Quick And Easy. Plant Cuttings Are Suspended In Mid-Air Where They Are Sprayed Constantly By A Highly-Oxygenated Aeroponic Mist. Roots Will Start To Appear In As Little As 3-5 Days For Most Varieties. Aeroponic Cloning Provides A Cheap And Effective Way To Clone All Of Your Favorite Plant Varieties. The Clone King 36 Will Make You An Expert Cloner From Your Very First Cutting. With The Clone King 36 you get everything you need to start cloning immediately. We can not emphasize enough how easy this machine is to use. Anyone can be successful by following a few simple directions. Cloning your favorite plant is a snap. Even if you have absolutely no cloning experience at all you can have your Clone King 36 set up and running within 30 minutes. A 100% success rate is the norm when cloning with The Clone King 36. This is a time tested design that has had fantastic success with a multitude of plant species and varieties. Expect plants to root in half the time of a conventional system without the problem of wilting or the trouble of a humidity dome. The Clone King 36 creates explosive root development which will aid in all phases of your plants life producing greater vigor and yield. In as little as 3 days you will see tiny root bumps coming off of your cutting. In 5-7 days roots are formed and expanding rapidly. At the 10-14 day mark your newly rooted plants are ready to transplant into whatever growing medium you prefer. Your new clones will perform great in dirt, a hydroponic or aeroponic grow system as they move to the vegetative growth stage. The Clone King 36 can easily adjust to root anywhere from 1 to 25 cuttings. Do not be fooled by over priced cloning machines. This machine will work as well if not better than anything on the market at half of the price. The Clone King 36 is unmatched in its simplicity, quality and success rate.